The GALILEI project aims to develop a coherent and integrated approach for information science. It proposes a common conceptual framework for different categories of algorithms (document clustering, search profiles computation, community of interests detection, etc..) and a open software research platform that implements them. It is intended as a scientific infrastructure, with which researchers can implement and evaluate their own algorithms, as well as a computer solution that can be deployed in industrial environments. Started in 2000 thanks research funding of the Walloon Region, the GALILEI project is maintained since 2010 by Paul Otlet Institute. The technical information (including the description of the API) and the scientific description (algorithms, models, etc.) of the GALILEI project can be found on WikiCS. 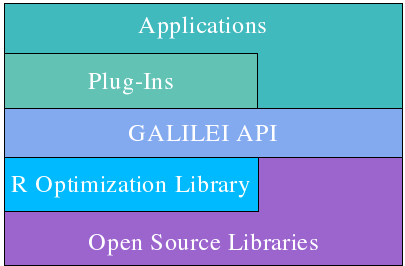 The GALILEI platform provides an C++ implementation of the theoretical framework. It proposes a library with a generic API (including basic tools) and a set of plug-ins providing the different algorithms. 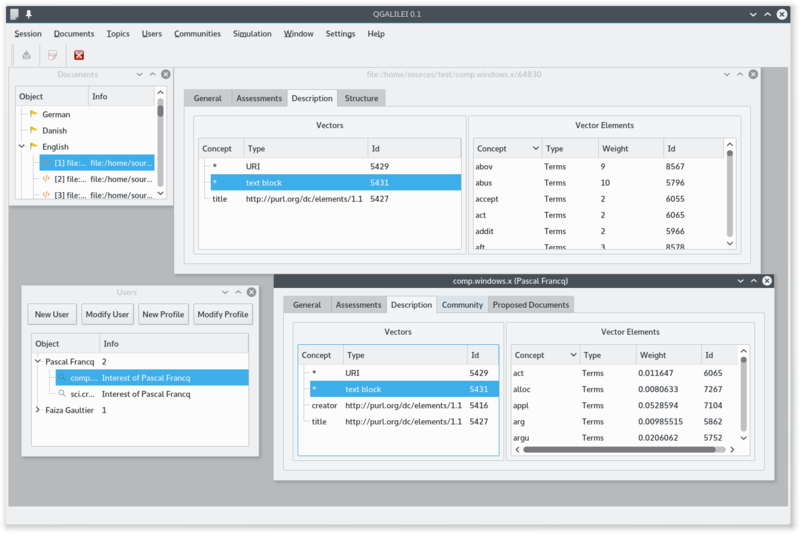 The GALILEI platform is available as free software (GNU LGPL). Currently, it represents an effort by more than 40 man-years. A set of existing free and open source libraries. The R libraries (also maintained by the Paul Otlet Institute) which provides several generic C++ tools. The actual C++ GALILEI library Which supplies different classes corresponding to the models of the theoretical framework. A set of plug-ins implementing the various algorithmes (stemming in many languages, text extraction, etc.). The applications to pilot the platform. All the source code (except the graphical part) complies with ANSI C + + and Posix, and the project management is done with cmake. Currently, only UNIX systems are supported (especially GNU/Linux), but the source code should compile in other environments. A description of the steps to build the platform is available on WikiCS. QGALILEI is a Qt-based application to monitor various aspects of the platform. The user can easily configure the plug-ins, initiate computational tasks, generate simulations, assess and consult the solutions. It was designed for researchers to easily pilot their experiments. UpGALILEI is a text application that runs a script describing the different tasks to execute. It has been designed to be launched automatically in a production environment (such as a software like cron).